William G. Cook, was born in Ohio on September 27, 1843. William enlisted as a private with the 40th Indiana Infantry on September 11, 1861. The state rolls show him enlisting as a member of Company B, at Mexico, Miami County, Indiana. William was involved in all of the marches and campaigns the regiment participated in, up to the Chattanooga Campaign. On November 25, 1863 the 40th Indiana Infantry was ordered to assault the heights of Missionary Ridge. During the attack, Corporal Cook was severely wounded by enemy fire. 1883 pension records show that William was a resident of Miller, Lake County, IN. The record reflects that he was wounded in the left leg and that he was received $8.00 per month for his wound. The wound was so severe that he was discharged from the service on a medical disability. There is no specific discharge date given on the state rolls. After the War, Will Cook worked as a Railroad Operator and later as an Agent for the Lakeshore & Michigan Southern Railroad at Miller Station. He was also the first postmaster in Miller, IN. William G. Cook died on August 16, 1897 and is buried in Lake County, Indiana. Two images of Thomas N. Moody, company C. He was wounded in the right hip during the assault on Missionary Ridge, November 25, 1863. He would spend months recovering in a military hospital before returning home and then back to the regiment. Thomas Moody enlisted in the 40th Indiana Infantry on September 13, 1862, and mustered out on June 14, 1865. Thomas is pictured wearing veteran stripes on his uniform sleeves. The two images are assumed to have been taken around the time that Thomas married Martha Ellen Clements, August 25th, 1864. After the war Thomas would return to Waveland, IN. where he owned and operated a livery stable. He passed away September 1928 at the age of 83, his grave is located at Maple Ridge Cemetery, Waveland, Indiana. Note: The images are courtesy of Moody’s great grand son, J.D. Gilliand. Today’s Civil War soldier has complete birth and death dates that always make Kim, Suzi and I happy. Born in Morgan County, Indiana, Isom R. Farmer was the son of Peter and Blanch Westley Farmer, entering the world on April 10, 1832. He was one of eleven children, having seven brothers and three sisters, at least one of his brothers serving in the Civil War, but not in the same company (Eli Co D 70th Indiana; Isom Co H, 40th). Isom (spelled Isham) was found with the large family in Morgan County in the 1850 census but appears June 22, 1854 in Montgomery when he married Lydia M. Moore. Her parents, Robert S. and Freelove (Groves) Moore lived in Waveland as did Isom and Lydia for a while until they moved to Crawfordsville on South Green Street. It was on October 6, 1862 when he was mustered into Company H, of the 40th Indiana Volunteers, Col. William C. Wilson, his commanding officer. He left Lydia home with three small children, upon a leave, producing her another child, then they would have three more, totaling seven children. Her mother and younger brothers were extremely helpful to her when Isom was off to war. Although he reupped once, he spent three years, mustering out on October 22, 1865. Company H saw many battles and skirmishes, the bigger ones being Stones River, Lookout Mountain, Chattahoochee, Peach Tree Creek and Nashville. Company H was filled with many of his friends, some of whom were lost, but Isom came home unscathed as far as is known. An exceptional carpenter, he and his sons worked side by side building and repairing homes, but before his death, Isom worked in a planing mill in Crawfordsville. He was hurt at work and developed weakness afterward. As sickness does, when you’re down, you’re vulnerable and Isom got a lung disease called quick consumption. His wife had passed away just a few months earlier, but with the lengthy consumption, sick for a very long time. Isom was gone within a few weeks. This was on March 31, 1888, he lacking just a few days before his 56th birthday and Lydia having passed at not yet 50. 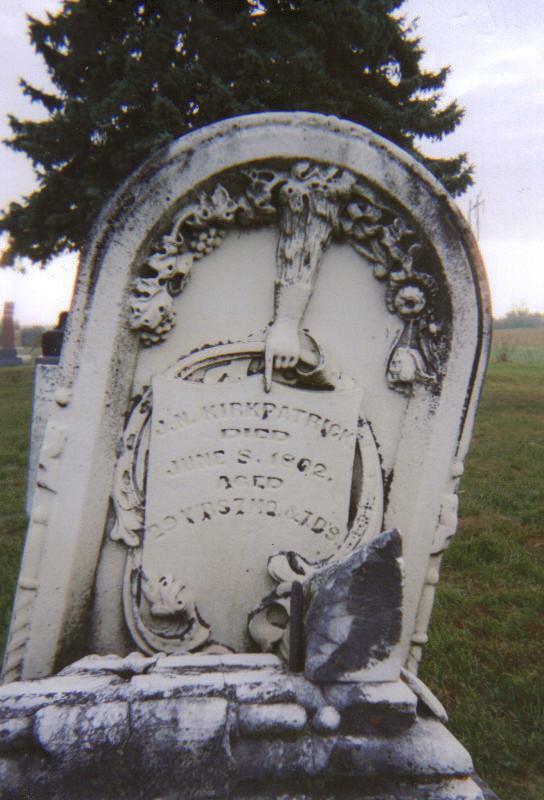 Buried in Oak Hill Cemetery, Isom had no gravestone. However, thanks to Suzi (Oak Hill Cemetery) and Kim (Kimberly Hancock), he can RIP one of Montgomery’s unknown heroes, Etched in Stone: one by one! Over the coming weeks and months I will write these columns highlighting each new stone. Karen Zach is the editor of Montgomery Memories, our monthly magazine all about Montgomery County. And she writes Around the County, which appears each Thursday in The Paper of Montgomery County. One by One: Etched in Stone is her latest offering and will appear periodically on Mondays in The Paper. Early wartime image of Private Isaac Yike (b.1838). Isaac was an original member of Company B, enlisting at Chili, Miami County, Indiana. 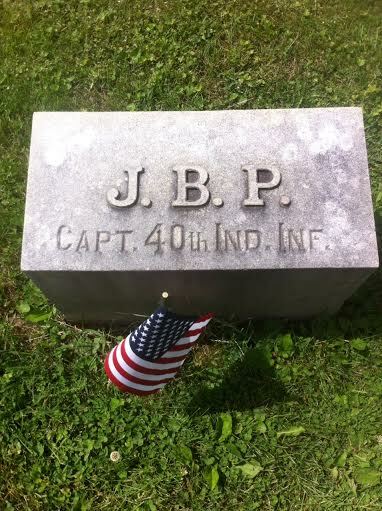 He was with the 40th Indiana during all of it’s hard fought battles. During 1864, Yike would reenlist as a Veteran Volunteer. By war’s end Isaac had attained the rank of sergeant. After the war he returned home to Miami County, where he would live until his death on August 21, 1907. This early image shows Private Yike wearing a frock coat, forage cap and grasping his 1853 Enfield rifle-musket. An article from the Lafayette Daily Courier, June 12, 1862. Lt. Col. Kirkpatrick’s grave, Wildcat Cemetery, Lafayette, IN. Capt. John B. Pence, superintendent gas company, Crawfordsville, was born in Frankfort, Clinton county, Indiana, August 29, 1833. His father was a farmer, and he worked on the farm in the summer to make money to pay his way in school during the winter. He attended Hanover College two terms, and Asbury University about one year. At the age of twenty-one he began clerking in the dry-goods store of P. S. Kelley, in Frankfort. He continued with him about one year and a half and then went into the dry-goods business for himself, and thus continued till the outbreak of the war. In the fall of 1861 he recruited Co. E, for the 40th Ind. reg., of which company he was made captain. He remained in the army about one year, and then resigned on account of ill-health. The principal engagement that he was in was the siege of Corinth. After the war he began in the drug business in Frankfort and continued until 1874, when he settled in Crawfordsville, and has ever since been superintendent of the gas company. Mr. Pence has traveled considerably in the different parts of the United States. In politics he is an ardent republican. He was married September 16, 1856, to Miss Sallie E. Kelley, daughter of P. S. Kelley, his old employer. Mr. and Mrs. Pence are both members of the Center Presbyterian church of this city. 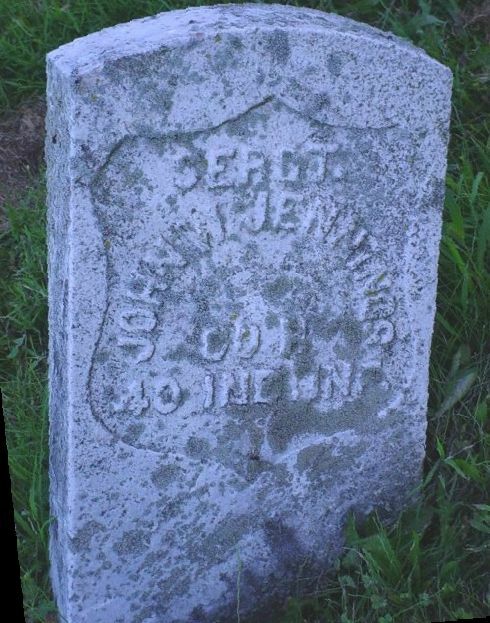 Sergeant John W. Jennings, Company H.
Grave of Sgt. John W. Jennings, Liberty Chapel, Cairo, Tippecanoe County. John W. Jennings one of the representative citizens of Tippecanoe County, is a native of this county, born in Tippecanoe Township, January 7, 1845, his father, Abel B. Jennings, being on of the old pioneers of the county. Abel B. Jennings was a native of Ohio, his wife, Minerva (Graves) Jennings, also being a native of the Buckeye State. They reared a family of nine children: F.M., living in Sioux City, Iowa; Sarah, living at Brookston, Indiana; MARTHA, at LaFayette; L.B. of Polk City, Iowa; L.N., P.L. and John W. are residents of Tippecanoe Township, and two, named Jacob and Mary E., deceased. Able Jennings lived in Tippecanoe Township until his death, which occurred March 1884. The mother of our subject is still living, aged sixty-six yeras. The father being a farmer by occupation, John W., our subject, was reared to the same avocation. He was a soldier in the war of the Rebellion, enlisting December 1, 1861, in Company H, Fortieth Indiana Infantry, and served in the Army of the Cumberland. He participated in the hard fought battles of Shiloh, Mission Ridge, Buzzard’s Roost, Resaca, New Hope Church and Kenesaw Mountain. June 27, 1864, at the battle of Kenesaw Mountain he received a severe gunshot wound in the left side of his face, which carried away his upper jaw and a part of his tongue. He was then confined in different hospitals until November 20, 1864, when he was honorably discharged on account of disability resulting from his wound from the effects of which he has never recovered. He then returned to Tippecanoe County, and was united in marriage April 6, 1866, to Miss Hester A. Shigley, a daughter of Adam P. and Rachel (O’Shal) Shigley, of Tippecanoe Township. They are the parents of eight children named as follows: Alice, Lizzie, Belle, George, James, Asa, Dora and Arthur. For three years after his marriage Mr. Jennings resided at LaFayette. He settled on the farm where he now resides on section 9, Tippecanoe Township, in 1887, where he has fifty acres of well-improved land, a comfortable and commodious residence and good farm buildings. In politics Mr. Jennings affiliates with the Republican party. He is a comrade of the John A. Logan Post, G.A.R., of LaFayette, and also belongs to the Odd Fellows lodge at Brookston, Indiana, No. 164. He is a member of the Methodist Episcopal church.